Objective: Obesity is a well-known risk factor for developing endometrial cancer. However, the incidence and survival rate of endometrial cancer are associated with ethnicity and geographical area. In addition, whether menopausal status is associated with developing endometrial cancer in obese women and whether obesity is associated with subtypes of endometrial cancer have not been fully investigated. Here, we investigated the effect of BMI on developing endometrial cancer in Chinese women taking into account menopausal status and cancer subtypes. Methods: Data on 1,127 women with endometrial cancer including body mass index (BMI), age at diagnosis, parity, menopausal status and cancer subtype were collected from the largest obstetrics & gynaecology hospital in China and analysed. 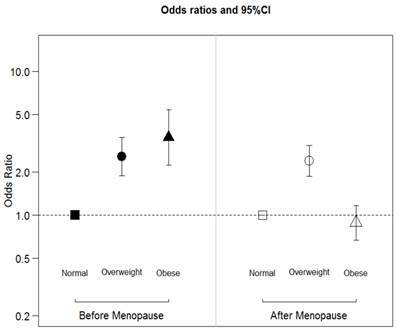 Results: After adjusting for age and parity, the odds for developing endometrial cancer in overweight or obese perimenopausal women was significantly higher than that in women with normal weight (OR=2.6 with 95%CI:1.9-3.5, and OR=3.5 with 95%CI: 2.2-5.4, respectively). The odds of developing endometrial cancer in overweight postmenopausal women were significantly higher than that in women who were normal weight (OR=2.4 with 95%CI: 1.8-3.1), however this was not the case for obese postmenopausal women. We further found that BMI, menopausal status, age and parity were not associated with subtypes of endometrial cancer. Conclusion: Our data demonstrate that obesity is positively associated with the incidence of developing endometrial cancer in Chinese women, with more significant effects in perimenopausal women. Endometrial cancer is the most common cancer of the female reproductive tract in developed countries and is the third most common cause of death from female cancers. In 2012, it occurred in 320,000 women and caused 76,000 deaths worldwide . The number of endometrial cancer has rapidly increased in Chinese women over the last ten years .The exact cause of endometrial cancer remains unknown, although several risk factors have been identified, including early menarche, nulliparity, late menopause, diabetes mellitus, hypertension, obesity, ethnicity and family history of endometrial cancer [3-8]. Obesity, as measured by body mass index, is a well-known risk factor for developing endometrial cancer. Recent meta-analyses suggest that women who are overweight or obese have a 1.43 or 3.33 fold increase in risk for developing endometrial cancer, respectively, compared to women with normal weight . However, a number of studies have reported that the incidence and survival rate of endometrial cancer are associated with ethnicity and geographical area [10-12]. Indeed, Chinese women will have different lifestyle and dietary habits compared to European or American women. The World Health Organisation (WHO) classification of BMI for Asians is also different from that for Caucasians. The WHO ethnic-specific BMI distribution data show that 10-12% of Chinese women are underweight (BMI<18.4), around 70% are normal weight (BMI=18.5-22.9 kg/m2), 10-15% are overweight (BMI=23-27.49 kg/m2), and only 2-3% are obese (BMI>27.50 kg/m2) . Most women with endometrial cancer in developed countries are diagnosed between the ages of 60 and 70 years old, and the average age is 61 . However, for the Chinese population, the mean age at diagnosis of endometrial cancer is younger (57 years old) than Caucasian women (64 years old) . A recent study also showed that 38.1% of Chinese women with endometrial cancer were diagnosed before menopause, compared to less than 25% of Caucasian women . Studies have reported that overweight/obesity is associated with the development of endometrial cancer in Chinese women [15-18]. One of these studies suggested that the association between cancer and obesity are relatively small in Chinese population , other study suggested that weight gain before menopause has significantly effect on development of endometrial cancer . However, some of these studies used the WHO classification of BMI for Europeans and Americans, not for Asians. In addition, none of these studies take into account menopausal status and subtypes of endometrial cancer to associate with BMI. Endometrial cancer is commonly divided into type I and type II, based on clinical features and pathogenesis. The two subtypes are also genetically distinct . Type I endometrial cancer is estrogen dependent and represent 75-90% of endometrial cancer , while type II endometrial cancer is estrogen independent. To date there are no previous studies investigating the relationship between obesity and type I and type II endometrial cancer. Therefore, we undertook this study to investigate the effect of BMI on the risk of developing endometrial cancer in Chinese women, taking into account menopausal status and cancer subtype. The retrospective data in this case control study were collected from January 2011 to December 2014 from The Hospital of Obstetrics and Gynaecology, Fudan University. This is the largest Obstetrics & Gynaecology university teaching hospital, serving a diverse urban and rural population in Shanghai, the largest city in China with a population of 20 million. Data on all patients admitted to the hospital with a primary diagnosis of endometrial cancer were collected according to the electronic based medical records of patients. Clinical characteristics included age at diagnosis, self-reported age at menopause, and parity. Patients were matched one to one by age frequency with women who underwent routine health examination were randomly selected from the same hospital during the same time period. Body mass index (BMI) was measured and calculated as the ratio of maternal weight and height (kg/m2) at diagnosis. According to the WHO classification of BMI for Asian/Indian women, the BMIs for underweight, normal weight, overweight and obese are under 18.4 kg/m2, 18.5-22.99 kg/m2, 23-27.49 kg/m2 and over 27.50 kg/m2, respectively. The effect of BMI, menopause and the interaction between BMI and menopause on the incidence of endometrial cancer adjusting for age and parity was analysed by logistic regression method using SAS software version 9.3 (SAS Institute Inc., Cary, NC, USA) with p <0.05 being considered statistically significant. The clinical characteristics of study participants are summarised in Table 1. The median age of patients at diagnosis was 55 (range 21-85) years old. Of the 1,127 patients, 94 (8.3%) were nulliparous, 489 (43.4%) patients were diagnosed before menopause and 739 (65.5%) were overweight or obese. Of 1,127 patients, 904 (80.2%) were diagnosed with type I endometrial cancer. The effect of BMI, menopause and the interaction between BMI and menopause on the probability of developing endometrial cancer was analysed using logistic regression, adjusting for parity and age. Join tests shows that the interaction effect of BMI and menopause on the probability of developing endometrial cancer was highly significant (p=0.0001). The significant interaction between BMI and menopause indicated the effect of BMI on the odds of developing endometrial cancer was not the same between perimenopausal and postmenopausal women. Therefore, further subgroup analyses were conducted on patients before and after menopause separately (Table 2). After adjusting for age and parity, the odds for developing endometrial cancer in overweight or obese Chinese perimenopausal women was significantly higher than that in women with normal weight (OR=2.6 with 95%CI:1.9-3.5, and OR=3.5 with 95%CI: 2.2-5.4, respectively) (Figure 1). The odds of developing endometrial cancer in overweight Chinese postmenopausal women were significantly higher than that in women who were normal weight (OR=2.4 with 95%CI: 1.8-3.1). However, there was no significant difference in the risk of developing endometrial cancer in obese Chinese postmenopausal women compared with women who were normal weight (OR=0.886 with 95%CI: 0.67-1.2). We further analysed whether BMI, menopausal status, age and parity were associated with subtypes of endometrial cancer (Table 3). None of these risk factors were significantly associated with either subtypes of endometrial cancer. The incidence of endometrial cancer varies by ethnicity[10-12], and is increasing in the Chinese population . Obesity is a well-known risk factor for developing endometrial cancer and it has been estimated that 40% of endometrial cancer is associated with obesity . However, few Chinese women are overweight or obese . This stimulated us to investigate whether obesity is a risk factor for developing endometrial cancer specifically in Chinese women. To date, only one other study has investigated the association between BMI and endometrial cancer in Chinese population , which found that women with BMI≥25.0kg/m2were more likely to develop endometrial cancer. In the current study, using WHO BMI classification for Asian women our data show that BMI>23 is associated with the development of endometrial cancer in Chinese women. This result confirms that the general consensus that increased BMI is positively associated with the development of endometrial cancer is also true in the Chinese population. Interestingly, in the current study we found that there is a significant interaction between BMI and menopause, suggesting that the positive association of BMI and the development of endometrial cancer are dependent on menopausal status. In this study, we found that overweight or obese Chinese perimenopausal women were three times more likely than normal-weight women to develop endometrial cancer. Overweight Chinese postmenopausal women were twice as likely as normal-weight women to develop endometrial cancer. However, there was no significant difference in developing endometrial cancer between Chinese postmenopausal women who were obese and Chinese postmenopausal women with normal weight. We cannot currently explain our finding that obesity is not associated with the risk of developing endometrial cancer in postmenopausal women but this result may suggest that the effects of obesity on the incidences of endometrial cancer are not fully understood . In Western countries, endometrial cancer is predominantly diagnosed at an older age (between 60 and 70 years old). However, compared with Caucasians, the age of diagnosis of endometrial cancer is earlier in Asian women including Chinese women . Our recent study also found that 38% of Chinese women were diagnosed with endometrial cancer before menopause . In this current study, we found that 43.4% of women with endometrial cancer were diagnosed before menopause with a median age of 47 years old. We do not know the exact reason for this difference, but ethnicity-specific changes in the levels of different hormones may play a role [23-25]. In addition, high levels of BMI (overweight and obese) are currently more common among middle age (40-50 years old) women in China compared to later age. Another study suggested that weight gain during adulthood, in particular during the time of perimenopause, is associated with the incidence of endometrial cancer . This may be because obesity is associated with an increased frequency of anovulation, a reduction of progesterone synthesis and endometrial exposure to unopposed estrogen in perimenopausal women . High levels of unopposed estrogen, and an imbalance between estrogen and progesterone levels, are some risk factors for developing endometrial cancer. To date, the majority of studies have considered endometrial cancer as a single disease, however endometrial cancer can be broadly classified into type I and type II, based on clinical features and histology. It is not clear whether the effect of obesity on the development of endometrial cancer is only associated with estrogen-dependent type I endometrial cancer. The shift in progesterone/estrogen balance by menopause may be associated with type I endometrial cancer. However, in this current study, we found that BMI, menopause, age and parity were not associated with the incidence of neither Type I nor Type II endometrial cancer. This is consistent with previous research, which found that parity, a well-known protective factor for the development of endometrial cancer, is not associated with the incidence of the two subtypes of endometrial cancer [22, 26]. This could be because the two types of endometrial cancer share many common risk factors and potentially suggests that type II endometrial cancer may not be completely estrogen independent . China has a lower incidence of endometrial cancer compared with the United States , but it is rapidly increasing . This could be due to industrialisation in China from the 1980s and the introduction of the Western/fast-food diet, resulting in the increase in BMI in Chinese women. Therefore, better understanding of the risk factors and development of endometrial cancer in the Chinese population has become imperative. Future research could investigate the incidence and risk factors for endometrial cancer in Chinese women who have immigrated to other developed countries. There are some limitations in this study in terms of generalizing the findings to China as a whole. All data were obtained from the largest university teaching hospital in the largest city in China over 4 years, which limited the sample size. The association between obesity and endometrial cancer may vary between regions and socioeconomic levels in China due to the different life style and dietary habits. In addition, case control studies are prone to bias, cohort studies would be ideal. In conclusion, compared to previous studies, in this case control study we found that obesity is positively associated with the incidence of developing endometrial cancer in Chinese women, with more significant effects in perimenopausal women compared to postmenopausal women. More important, to authors' knowledge, this is the first report that BMI, menopause, age and parity are not associated with the two subtypes of endometrial cancer. Endometrial cancer often occurs after menopause in Caucasian women reported in the literature , our study may recommend that an endometrial biopsy be performed when obese Chinese women with abnormal uterine bleeding present, even if they are perimenopausal.